“The Mayor has taken a year to make this decision and while he has been dithering more money has been wasted. Yet while it is regrettable that Sadiq Khan has taken so long to make a decision he has finally done the right thing following Dame Margaret Hodge's damning report. “This is a totally damning report. It is a disgrace that key decisions on the Garden Bridge were driven by electoral cycles rather than any concern for value for money. The report also backs up the long standing finding of the London Assembly that the procurement processes were not open, fair or competitive. “The Mayor is repeatedly on record as saying he backs the strategic target of London having 32,000 police officers, yet in his very first budget he want to remove the very means to achieve that target. “This report highlights how much child protection issues have been marginalised by the Met. The HMIC are absolutely right to highlight their serious concern that within the Met there is no single person at a senior level who is responsible and with oversight of child protection work. 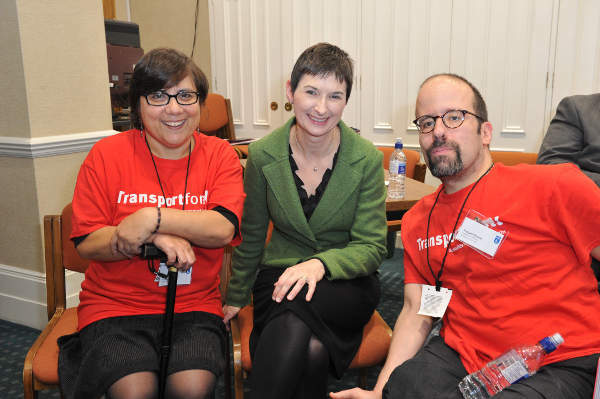 Caroline Pidgeon, visited a Guide Dogs event in Parliament on 16th November to show her support for taxi and minicab drivers receiving disability equality training when getting their licence. In September, the London Assembly passed a motion supporting Guide Dogs’ call for an increase in the penalty for refusing access to an assistance dog owner. "After an incredibly expensive lobbying campaign the Government has ‎foolishly accepted the myth that what is good for the overseas owners of Heathrow is also good for the UK economy. Caroline writes for the Womanthology website on the changing face of transport policy and the importance of seeing the world from the viewpoint of women as well as men. When most people think of the transport industry their immediate image is of a very male dominated world. From train drivers and leaders of their unions through to the senior management of train companies, the common factor is male dominance.